Every afternoon, I have a cup of hot tea. Usually, I also make myself a glass of iced tea, for after I finish my hot tea. 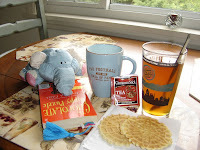 Yesterday, I settled in for an afternoon tea treat of hot cinnamon tea, iced peach tea, pizzelles, and a mystery book. I love reading, especially mysteries. Recently, I've been reading the Chocoholic Mysteries by Joanna Carl, the Blackbird Sisters Mysteries by Nancy Martin, and the Tea Shop Mysteries by Laura Childs. I finished reading all the books in the Blackbird Sisters series and the Tea Shop series and now have the Chocoholic series to finish. Yesterday, I finished reading The Chocolate Puppy Puzzle. I really enjoy immersing myself in a make believe mystery world with my favorite things (tea, chocolate). The Chocoholic series features Lee McKinney, a Texas beauty queen transplanted to a Lake Michigan resort town, where she is business manager for TenHuis Chocolate, a business owned by her aunt, Nettie TenHuis. I like that Joanna Carl includes chocolate trivia and facts in her books, just like Laura Childs includes lots of tea information and recipes for tea treats in her tea mysteries..